THIS unique recipe incorporates a local favourite that will surely be a delight to cendol and mooncake lovers.This recipe was first published in Flavours magazine. Place the water, sugar, agar-agar powder and pandan leaves into a pot and boil over high heat for about 5 minutes. Reduce heat to medium, then add the coconut milk, custard powder and food colouring and cook until it boils. Turn off heat. Pour the jelly mixture into a ball ice-cube tray and cover the tray with a heavy object. Leave jelly to set completely before unmoulding. Place the quinoa and 40ml of water into a pot and cook until quinoa is fluffy. Set aside. Place the remaining water and palm sugar into a small saucepan and boil until sugar dissolves, then add the agar-agar powder, salt and pandan leaves. Bring to a boil, stirring continuously. Add the quinoa, coconut milk and custard mixture. Bring to a boil then immediately turn off the heat. Pour mixture into the round tart moulds and place a jelly yolk in each centre. Allow to set completely. Blend the pandan leaves with water then sieve the mixture. Pour into a pot over high heat. Add the castor sugar and agar-agar powder and bring to a boil. Reduce heat then stir in the remaining ingredients with a wire whisk until mixture starts to bubble. Remove from heat and leave to cool slightly. 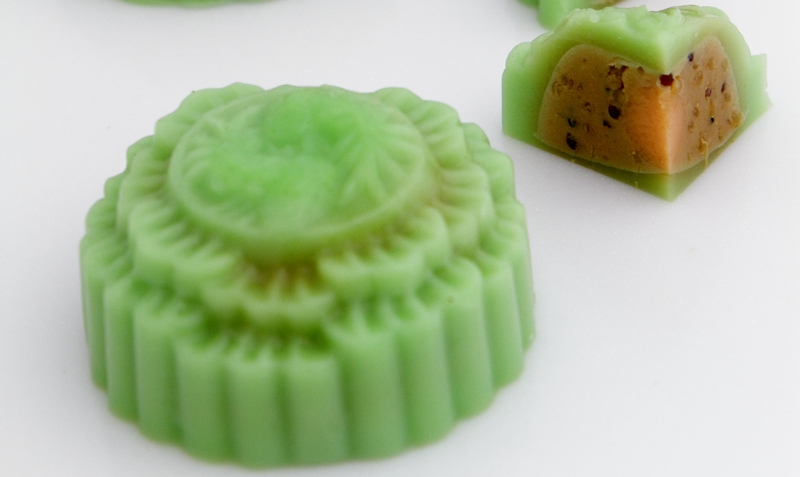 Pour a 1/2cm layer of jelly skin mixture into the plastic mooncake mould. Leave to cool until almost set. Pour in another 1 to 2 tablespoons jelly skin mixture then place a prepared cendol quinoa filling into the centre of the mould. Top with more jelly skin mixture and allow it to set completely before chilling the mooncakes in a fridge. To serve, run a bamboo skewer through the sides of the mould, then unmould the mooncakes. The mooncakes can be stored for up to 5 days in a fridge. Do note that you will also need a ball ice-cube tray, 9 to 10 round tart moulds (6cm in diameter, 2.5cm in height), and plastic mooncake jelly moulds.